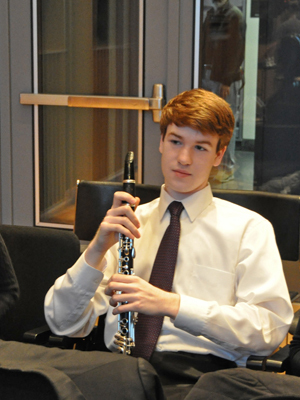 Christopher won the principal clarinet position at the Cincinnati Symphony Orchestra in May of 2018! Christopher Pell appeared most recently on Show 196, recorded in May 2009, at age 18. The Shapka Trio is comprised of clarinetist Christopher Pell (18, Bronx, NY), cellist Madeline Fayette (17, Wading River, NY), and pianist Dasha Burkhartseva (16, New York, NY). They are coached by Anthony Brackett of the Juilliard School Pre-College Division. Both Christopher and Dasha are past recipients of From the Top’s $10,000 Jack Kent Cooke Young Artist Awards and have previously appeared on From the Top. Christopher is a Jack Kent Cooke Young Artist.